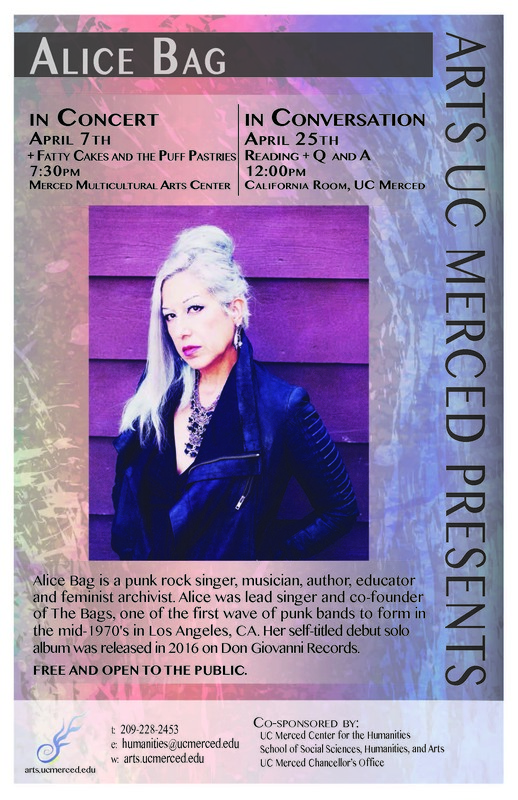 Alice Bag is a punk rock singer, musician, author, educator and feminist archivist. Alice was lead singer and co-founder of The Bags, one of the first wave of punk bands to form in the mid-1970's in Los Angeles, CA. Her self-titled debut solo album was released in 2016 on Don Giovanni Records. Fatty Cakes and the Puff Pastries is an all grrrl gang band from Fresno, CA that promotes positive mental health and being yrself at the buffet. Doors at 7pm; Music starts at 7:30pm. Free and open to the public. This concert is presented by Arts UC Merced Presents and co-sponsored by UC Merced Center for the Humanities, UC Merced School of Social Sciences, Humanities, and Arts, and UC Merced Chancellor's Office.